If you have a Facebook page and an Instagram business account, you can direct users straight to your website or book form by adding a “Book Now” banner below a photo or video post. It’s free to set up a Facebook page and Instagram business account, and you can determine how much you want to spend on your Instagram ads. 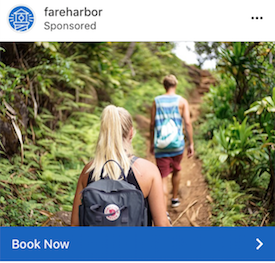 On this page we’ll show you how to set up Instagram ads and generate a FareHarbor link to take customers straight to your booking process. Detailed steps can be found in Facebook’s Help Center. Campaign objective: We recommend selecting the Conversions objective. Keep in mind you’ll need the Facebook pixel added to your website for this to work. Placements: If you only want to create Instagram ads, remember to select Instagram > Feed and uncheck the rest of the boxes. Add a website URL: Make sure this box is checked in order to drive traffic to your site. Website URL: If you want to link to a specific page on your website, simply copy the desired page URL and enter it here. Otherwise, follow the steps in the next section to generate a link that will go directly to your FareHarbor booking flow. Once you’re done, place your order and manage your ads in Facebook. We are happy to generate this link for you! Contact us and let us know where users should be taken when clicking your ad. 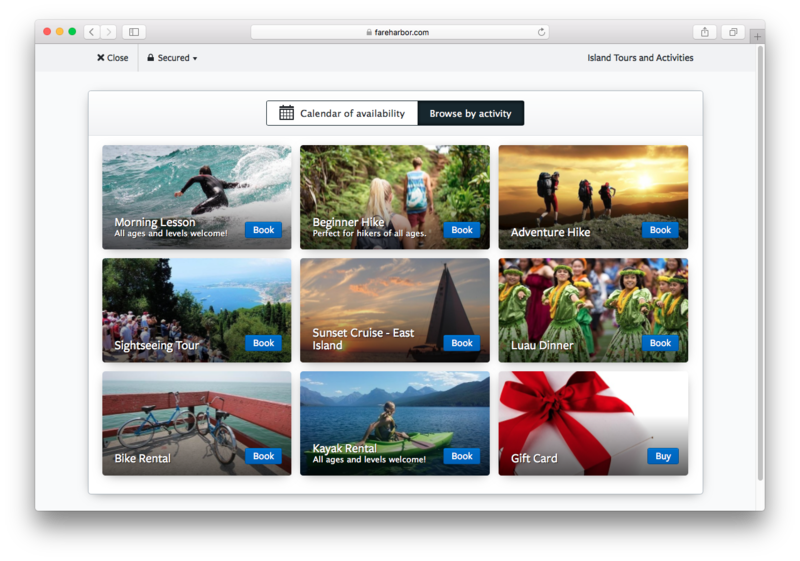 Below is an example of an embedded grid of items generated by FareHarbor. When your customer clicks the “Book Now” button from your Facebook page, they’ll be taken straight to a page like this where they can start booking. In the first section, make sure Book button or link is selected. Below the label field, choose where the link should take the customer. 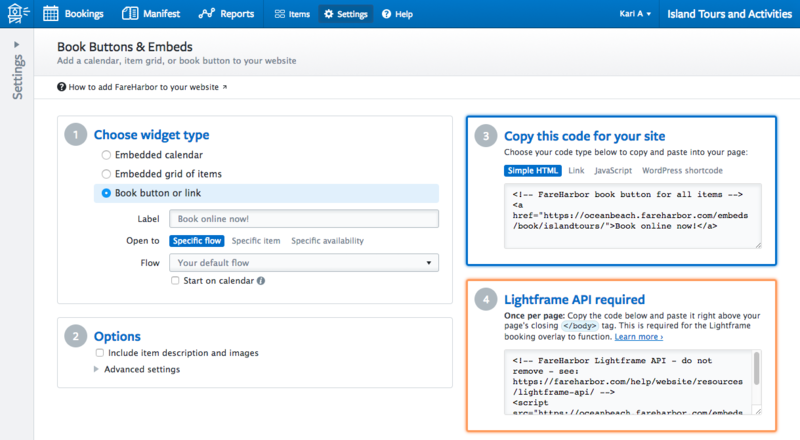 In most cases, you’ll want to keep the default option (Specific Flow: Your default flow) to direct the customer to a page with all your activities. Learn more about these options. Optional: In the second section, choose whether to include item descriptions and images (we recommend doing this). In the third section, change the selection from Simple HTML to Link, and copy the text in the box. Note: For this purpose, you can disregard the fourth section (“Lightframe API required”). The code in this section is only needed when integrating FareHarbor with your website. When your ad uses this link, Instagram users who click on your Book Now banner will be directed straight to the mobile-optimized online booking flow. Need help? Contact us and a member of our team will happily walk you through the process!